No matter what you want to update (jeans, an old t-shirt, a dress, etc. ), you can easily turn a one-colored article of clothing into a two-toned one. Simply decide what color you want to show through, then cut out a pattern shape (such as a heart or a flower). After that, place the colored fabric on the inside of your clothing and sew around the edges so that when you wear it, you can see the second color through the shape. One of the easiest ways to spruce up old clothing is to add some flowers to it. Whether you make the fabric flowers yourself or you buy them at your local craft store, you can add flowers to nearly any part of your piece of clothing. Try sewing them around your collar for a fun neckline or around the bottom hem for a pop. You can also sew a line of them down the back of a shirt or down the side hem of a pair of jeans for a neat effect. Sick of that old yellow sweater? Dye it green! Or maybe you don’t like your old jeans because they’re faded – dye them back to blue! (Or even better, choose a new color like purple or magenta.) You can give any piece of clothing a whole new look just by dying it. Like flowers, bows are an easy way to spruce up shirts, sweaters, jeans, tank tops, etc. Attach them to any area of your clothing for a pop of color or texture. Or, go a little bolder and cut down the back of a shirt or down the sleeves of a long-sleeved shirt and tie the two sides together using bows for a pretty, but edgy accent. At American Patch, we frequently make clothing patches for people who want to spruce up their jeans, hats, jackets, and more. Because our patches are customized to your desired artwork, you can create virtually any design, pattern, image, or phrase to sew onto your clothing. If you’re wondering what to do with your old boring shirt, cut out a small design (like circles or hearts) to show a few little peeks of skin. You can also cut out larger designs for the back of the shirt, side of the shirt, or down the sleeves. This idea works best on form-fitting shirts. Sequins not only add sparkle, but they add shine, and how many sequins you add is completely up to you. You can string a few strands around your neckline, line the bottom hem, or cover a pair of shorts with them to create a dressy alternative. Lace can spruce up your clothing in many different ways. A line of lace along the bottom of a pair of shorts or a dress can make them longer and add a touch of femininity. A large piece of lace sewn over the shoulder or down the sleeves of a shirt can give it an edge. A band of lace around the middle of a shirt can add some texture. You can even cut out a section of a shirt or dress and sew lace over top of it to create a sheer accent – the possibilities are endless. Love to embroider? Create your very own artwork on your clothing by stitching on a pattern, a design, a quote, or some shapes. You can any color thread to make your creation subtly noticeable or stand out boldly. Are your jeans too short? Cut off the legs and turn them into shorts! Is your t-shirt too big? Cut off the sleeves and collar and turn it into a bathing suit cover-up! 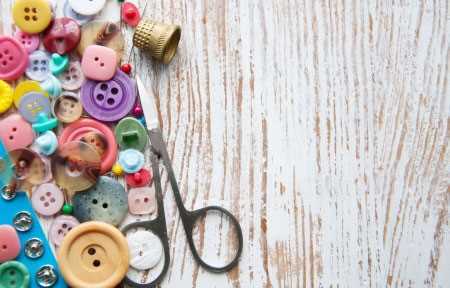 There are hundreds of ways to transform one article of clothing into another – just do some searching and pick the one you like most. This entry was posted in DIY and tagged crafts, DIY, dyed, embroidery, patching, sewing, thread.